Head of CDU’s School of Education Peter Kell will travel to East Timor with Education lecturers Lorraine Sushames (centre) and Therese Kersten to take part in "Steps to the Future: a cooperative workshop for education and training in East Timor"
Australian and East Timorese educators will join forces this week to tackle issues related to providing education in one of the world's newest nations. Researchers from Charles Darwin University and East Timor will take part in a two-day workshop entitled “Steps to the Future: a cooperative workshop for education and training in East Timor”. CDU representatives from the School of Education and more than 12 East Timorese authors will give presentations on literacy and numeracy, vocational education, teaching English and teacher education. Professor Peter Kell said he expected the event to strengthen links between Australia and East Timor, and boost the presence of CDU in the region. 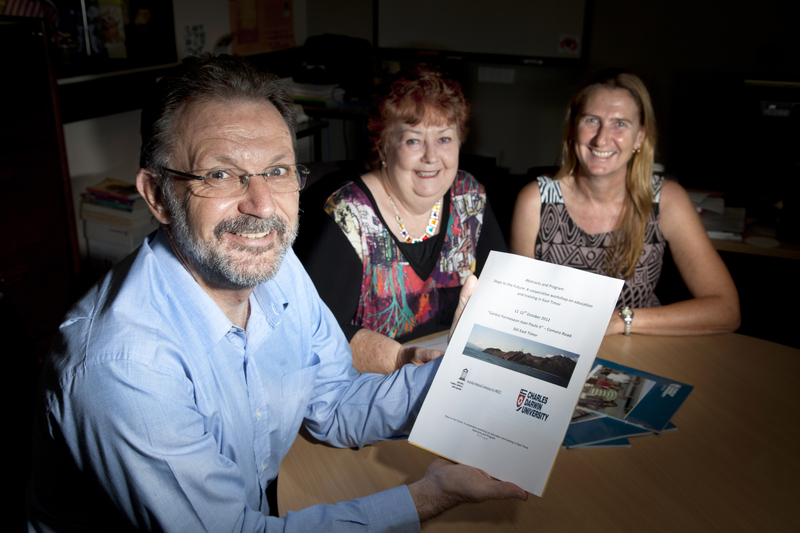 "The workshop will provide a forum for budding East Timorese academics to have their works published," Professor Kell said. The workshop will involve education providers and government and non-government agencies in East Timor, including The National University of East Timor (UNTL), Dili Institute of Technology, AusAID, the Alola Foundation, Lorosa'e English Language Institute (LELI) and Ministry of Education. The two-day workshop is being led by CDU and funded by the Australian National Commission for UNESCO. It will run from 11 October in Dili. For further information visit W: stepstothefuture.cdu.edu.au.